I had booked into a seminar held by The Design Trust at the British Library yesterday morning and so I tubed it up to Euston. Making my way through the station, I saw a blind woman heading straight towards a wall which, thankfully, her white stick stopped her crashing into. I went over to offer my help and she said she had got confused and lost her bearings. I guided her back towards the escalator and once we were ascending she thanked me and said she was ok from there. However that little encounter stayed in my head, particularly as she was the second blind person I’ve helped in a busy tube station in the last fortnight. The London tube network is confusing enough for a sighted person, but trying to navigate the swirling crowds and warren-like tunnels and escalators without sight must be nerve-wracking. 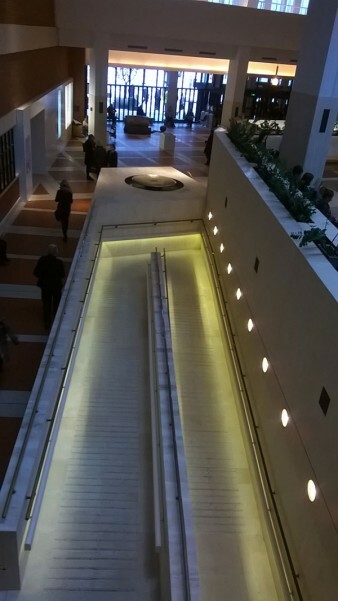 I arrived at the British Library ready to learn…. the seminar was on PR for small businesses, something at which I have proved to be consistently poor! Talks were given by Barbara Chandler (the Design writer for the Evening Standard), Lara Watson (the editor of Mollie Makes magazine), and Paula Gardner of DoYourOwnPr. 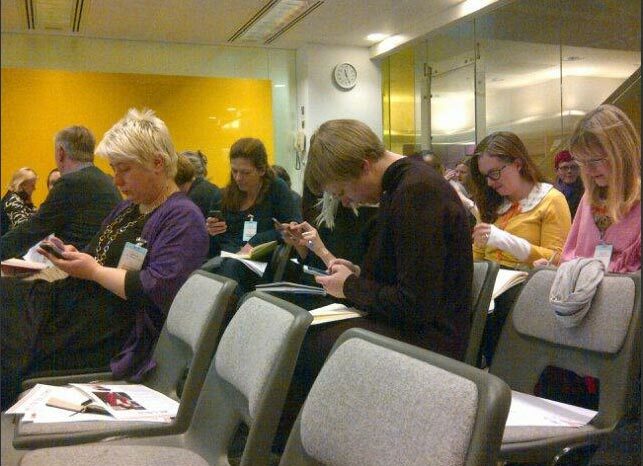 As the experts spoke, I rather resignedly realised there really is no getting away from social media. Forget formal press releases; these days it’s all about Twitter, Linked In, blogging, pinning and posting on Instagram. I feel like I’ve spent years avoiding all of that social media stuff for a good reason, namely the huge black hole of time you fall into when you start doing it. I finally relented last year and reluctantly became a fully paid up member of the social media generation, and since then I feel like all I’ve done is (virtually) talk rather than (actually) doing. I just want to be making, but instead I have been led down what feels like a relentless labyrinth of online chatter, where somehow you have to make your voice heard… a vast, unending tangle of online imagery which you need to engage with in the most shallow and fleeting manner. I want to be in the world of objects, where touch and feel invokes memory, not a flickering instant in the stream of images that we imbibe on a daily basis through social media. I want to be in a world where, if three experts are talking, the audience in the room are respectfully paying attention to what they say rather than snapping images of them to tweet to their thousands of followers. The irony was not lost on me that during one of the exercises we were set to write a press launch in 140 characters to tweet, my neighbour showed me her twitter feed where a photo had just appeared of herself looking at her twitter which had just been taken and tweeted by Barbara Chandler whom she follows! Was I the only person in the room who found the glorious self-reflexivity of the situation totally ludicrous?! And suddenly it struck me. I am like that blind woman in the tube…. clumsily trying to orient myself in a swirling, ever-changing torrent of information, looking for the way up and out, but heading the wrong way towards a dead end, and everyone else can see my fate but me! As the seminar came to an end and my moment of metaphorical clarity was complete, I bumped into Sarah Young, one of the artists we invited to our Designed Crafted Christmas show. She was a welcome voice of assent and we had a little rant about the awfulness of social media, but I reflected that she and her partner Jon – with whom she runs Made London and Made Brighton – have managed to successfully navigate the labyrinth of social media (4000 twitter followers and counting!) without losing their integrity or sense of direction. It had been a thought-provoking three hours, and as I emerged from the building and through the beautifully lettered portico of the British Library entrance, I was gobsmacked to see the blind lady from earlier, walking confidently along the congested Euston Road and back towards the tube.